Neve Kamilah Mazique-Bianco’s one-femme play “Bet Ya Ungodly Things,” which opened over the weekend at Gay City, cast a spell with its gut-wrenching, endearing and nuanced story of a coming-of-age friendship. Mazique-Bianco’s play was inspired by Virginia Hamilton’s short story “The MerWoman Out of the Sea,” but it is uniquely its own incarnation that manages to tap into the very essence of the human experience. “Bet Ya Ungodly Things” is a story of water and floods, of tears and blood, of small towns, small minds, and small girls with big imaginations and big feelings. As with any fictionalized memoir I found myself wondering which parts of the story were true and which parts were made up. I ultimately decided that the facts were less important that the emotions, which all rang true. The show focuses on Snow, a half-black half-white girl in a wheelchair, and Fonn, a seal-person “born of blood and a raindrop.” They survive growing up together in Clinton, New Jersey. The house lights dimmed and what was a white backdrop was filled with the projected image of a black white drawing to set the scene. As Mazique-Bianco rolled from one part of the stage to the other, the image slid across their skin as though the town itself were a moving tattoo. Mazique-Bianco’s show begins with the story of the silkie, the legendary seal-person from Scottish mythology, who appeared to a little girl who had suffered a trauma. The monologue and dialogues were exquisitely written and Mazique-Bianco’s performance brought beauty to the stage. But this was not a beautiful story. It’s a gritty, complex narrative of trauma and survival interspersed with moments of joy, friendship and levity. The show included original songs written and performed by Mazique-Bianco. Composer Nic Masangkay also provided music for dance numbers which matched the narrative perfectly. 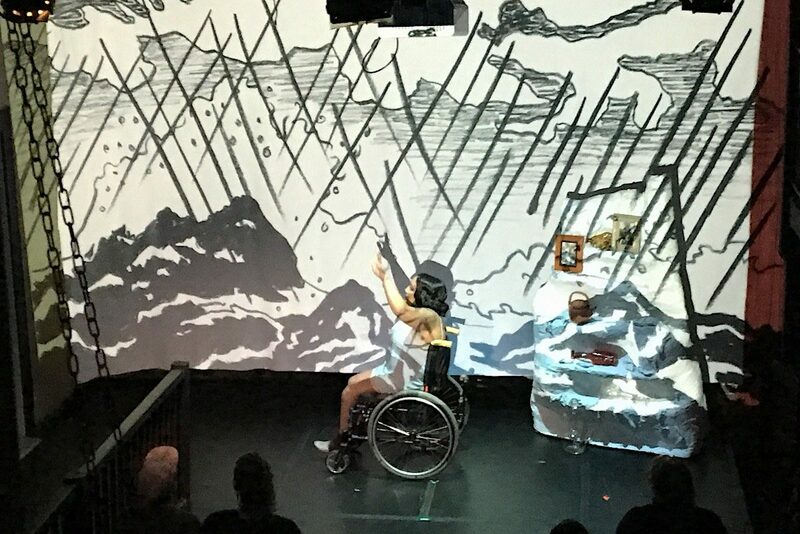 This was the first time I’d seen a someone in a wheelchair dance, other than on the television show “Glee.” I feel embarrassed to admit I had no idea how glorious and graceful it could be. Instead of marveling at seemingly effortless feats of acrobatics, Mazique-Bianco’s dance performances had a vulnerability and realness. The dances were a reminder that joy is worth striving for, even when it doesn’t come through ease. The incredible content of the show is also enhanced by Gay City’s truly inclusive environment. Though the story itself was set in New Jersey — or as Assata Shakur would say “Up South” — the theater grounded the audience in the present before entering its magical retelling of the past. Gay City greeted audience members with a page-long explanation of their fragrance-free policy, and a volunteer sniffed us to clear us to enter the space. I felt a mix of discomfort and deep appreciation for this unexpected learning moment. When inclusivity requires adjustment it brings to light the invisible privileges we carry and also the ways in which our unconscious norms can sometimes create exclusion. While that can feel awkward, it’s only in the light of understanding and really thinking about someone else’s experience that we can create change. The audience seating area also had a fragrance-free section, as well as a section for the deaf and hard of hearing. A large screen provided live captions for the audience throughout the event. The theater also identified a counselor as an available resource for audience members who needed immediate support for their own past trauma. Just before the performance, Mazique-Bianco was joined by costumer Kara Phoebe and production manager Kate Silvette for an invocation. “I feel you, I understand you, I honor you,” they each said to one another acknowledging the various components of their identities. The invocation also honored the Duwamish as the rightful stewards of this land. Gay City’s policies and practices address equity in a comprehensive way that requires participation. It was no trouble to remove a seat in the aisle so a wheelchair can fit in the row or asking an audience member to adjust so that someone could see the dialogue on the screen. These aren’t big asks, but the concept of community accountability is one that is often talked about in theory and rarely put into practice. Sometimes there is a magic beyond props and scripts and poetry. It’s not what lives in the state of suspended reality, but rather what happens when someone shares a truth about themselves that resonates to the very core of you and heals something there. Experiencing this performance was a transformative gift of healing, self-acceptance and grace. But no more spoilers. This is a performance you should experience for yourself. During the intermission, people of color were invited to write a wish on a slip of yellow fabric to be incorporated into a closing ritual. I wrote a prayer for healing and this gave me so much more than I even knew I was asking for. I hope it does the same for you. Catch “Bet Ya Ungodly Things” at Gay City, 517 E. Pike Street, through Jan. 19. Tickets are available through Gay City’s website. 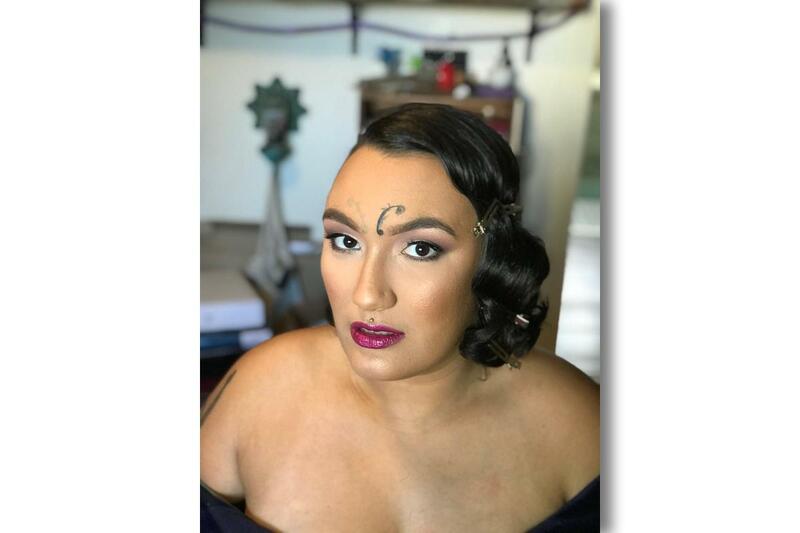 Correction: Neve Kamilah Mazique-Bianco wrote and sang original songs for “Bet Ya Ungodly Things,” and Nic Masangkay composed music for the dance performances in the production. An earlier version of this article incorrectly stated who wrote the songs.